Massaging shower heads offer a perfect way for you to relax in the shower while soothing achy muscles and joints. These shower heads can be a little pricier than standard shower heads, but if comfort it what you’re looking for, the slightly higher price can be worth it. Finding the best massage shower head for your bathroom depends on your budget and what other features you’d like in addition to a massaging pulse. 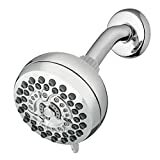 Our reviews can help you navigate your options and find the best massage shower head to meet your needs. The Hydroluxe Ultra-Luxury 3-way 2 in 1 Shower-Head is a combination handheld and fixed showerhead unit that has 24 water patterns, including massaging settings that you can use on both showerheads at once. 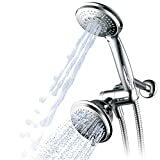 The Aqua Elegante Massage & Mist Adjustable Shower Head has three settings, including a power massager that can relieve muscle aches and pains while you wash. The Waterpik High Pressure 7-Mode PowerPulse Massage Shower is a fixed head with technology that helps you get high water flow even if you have low water pressure for an ultimate shower massage. 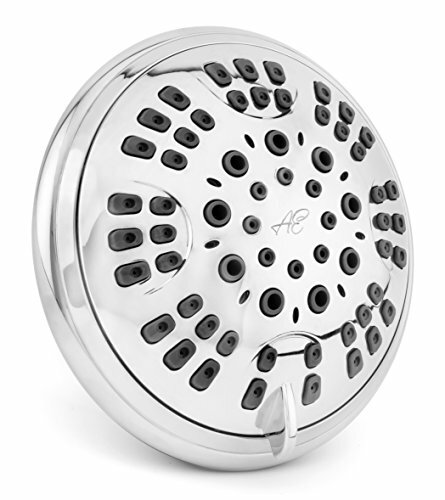 If you want a simple upgrade for your current shower head, the AquaDance High Pressure 6-Setting Shower Head might be an excellent option with its multiple settings and simple, tool-free installation. Our massage shower head reviews feature our top five picks based on their features and quality for their prices and customer satisfaction. 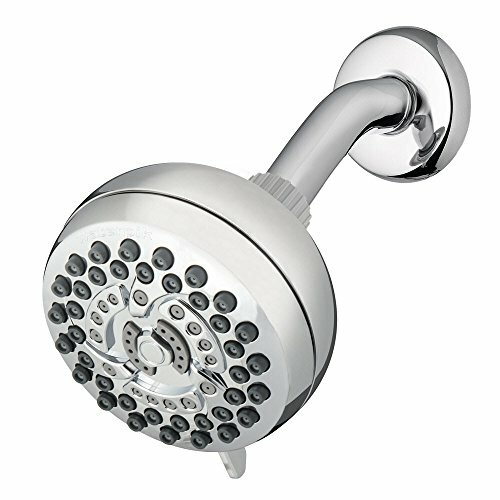 This shower head by Aqua Elegante is one of its most popular models. Its low price point is budget-friendly, especially considering the features it provides. The shower head has 6 settings, with two of them different massage settings. You can choose between a high-pressure massage or a gentler pulsating massage depending on your needs and preferences. It’s simple to change between settings using the lever. Just rotate the lever to switch settings as the water runs. 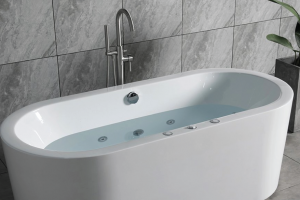 One of the best features of the Aqua Elegante is that it’s designed to increase low water pressure to help you make the most of its massage settings. You can remove the water flow restrictor easily, if needed, but the shower head itself works to push your water through the self-cleaning jets with ease to give your pressure a boost. 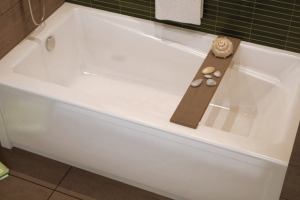 Customers appreciate the simplicity of the Aqua Elegance’s installation and how powerful it is for its small size. If you’re not looking for a shower head with several different settings you’re not likely to use, the Aqua Elegante Massage & Mist may be the best option for you. This one focuses solely on people who want their showers to double as relaxing massages with its three settings: regular, power massage, and gentle mist. You can also mix your favorite modes together with two mixed-mode options, so you can combine massaging and mist for a spa-like shower. The lever makes switching between modes as easy as possible while you’re in the shower. Silicone, slightly protruding nozzles keep jets self-cleaning by preventing hard water buildup on the shower head’s face. The plated, smooth finish on the face can also make it simple for you to wipe down to keep grime from building up occasionally. Some customers dislike the noise that comes from this shower head, which seems to be mostly heard in homes with high water pressure. However, most agree that the shower head gives just the right amount of pressure through the massage setting to soothe joints and muscles. We like that the Hydroluxe Ultra-Luxury 3-way 2 in 1 Showerhead can give a lot of flexibility to the average family’s shower. This dual shower head unit is unique in that it offers multiple settings in each of its heads, so you can set them both to massage for a full-body massaging experience, or just set one to massage and choose a different setting for the other head. With its 5-foot flexible hose, this dual-head unit can be an excellent solution for families who have kids or pets that need a handheld shower head for convenient bathing. Both shower heads have 4-inch faces, which is a bit larger than standard shower head sizes. With several jet sprayers in each, you’ll have plenty of water flow to keep you warm and comfortable in the shower. Some customers had difficulty getting the water-reducing valve out of each shower head, but many agree that the unit itself was straightforward to install without tools. The Waterpik High Pressure 7-Mode PowerPulse shower head is designed for people who want to transform their regular shower into a spa with ease. 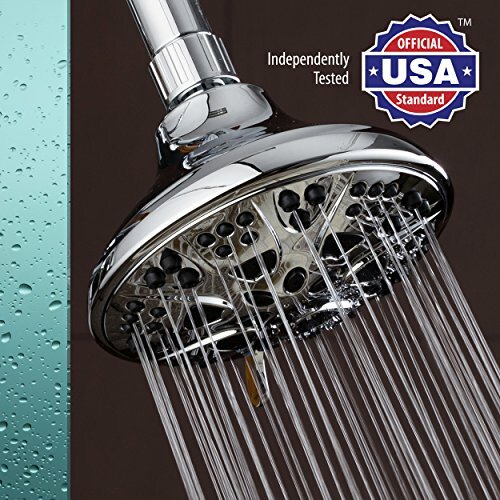 This shower head is one of the best options for homes with low pressure. 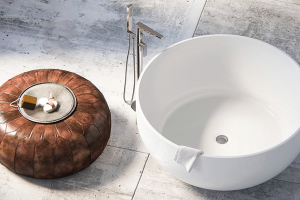 It uses OptiFlow technology, which enhances the internal design to push low-pressure streams through the shower head with more force to give the user stronger sprays. This comes in handy for the massaging settings. The Waterpik is known for its power pulse massage, which can give you one of the strongest massaging sprays to provide you with a deep-water massage without feeling uncomfortable. The fixed head is about 4-inches in diameter, allowing a decent spray width, yet compact enough for small shower areas. One downside of this massaging head that some customers agree on is that its chrome finish looks more plastic than high-end. However, customers generally agree that the shower head couldn’t be easier to install and it performs as expected with most water pressures. The AquaDance High Pressure 6-Setting Shower Head has the lowest price point of the options in our guide yet give you and your family a variety of settings and features for the money. If you’re looking for an inexpensive upgrade and don’t mind a simple-looking shower head, this may be your best option. 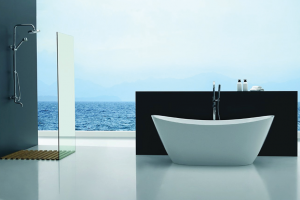 Several of the six settings are perfect for those who love shower massages. Choose from rain massage, power rain, and pulsating massage, all of which can give you a different massaging feeling depending on your current mood. You can also purchase the same showerhead in a handheld version for just a few dollars more, which can come in handy for bathing pets, kids, or even cleaning up your shower area. With a 5-foot hose, you can reach most areas of the shower easily. One of the biggest pros of this shower head, customers say, is its leak-less design that may even outperform higher-end shower heads. 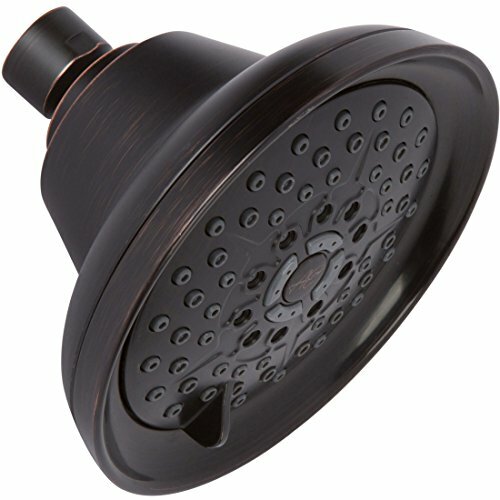 How Do Massaging Shower Heads Differ from Others? Massaging shower heads typically look like regular shower heads, except that they’ll have a unique setting that allows their water jets to pulsate water, resulting in a spa-worthy experience that gently sprays water rhythmically to massage your skin and muscles as you shower. Most of the time, these shower heads have multiple settings in addition to their regular and massage settings. This is helpful for families because some household members may not like the feeling of massaging sprays. There aren’t many massage shower heads that only allow massage sprays. They’ll instead usually have a regular spray setting too. Most have more than these two settings, offering other spray patterns like rainfall, mist, or water-saving features. You can usually find shower heads with multiple settings for similar prices to those with just one or two, which can give you more for your money. Although you may not think you need or want all the extra settings, they can be beneficial to have because you might find that you like switching between them in the shower. Also, more settings mean more options for everyone in the family! Whether you have low or high water pressure in your home, you should be able to have a shower head that can accommodate it. Many of today’s shower heads include technology that can boost low water pressure, yet also include a water-reducing device that can curb high water pressure issues. These types of shower heads are essential for houses with fluctuating water pressure. You should consider one with a removable water-reducing device that you can remove when your water pressure is low or re-install if your pressure becomes too high. 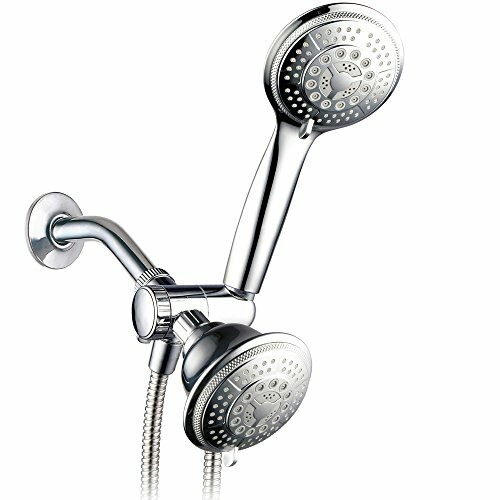 If you want the most uncomplicated installation possible for a quick shower head upgrade, it’s important to look for a shower head that’s marked with “Tool-Free Installation.” This indicates that you won’t need a screwdriver or wrench to install your shower head and can instead loosen and tighten the connecting nuts with your hand. It’s important to read the reviews of real customers, too, before choosing your shower head because they often include information about the ease of installation. The shower heads in our reviews are ones we’ve vetted to make sure they’re as easy as possible to install. We’ve mentioned five excellent massaging shower head options in our guide, but the Aqua Elegante 6 Function Adjustable Luxury Shower Head is one that stands out as being a shower head that offers the most variety and best performance for virtually anyone in the family. 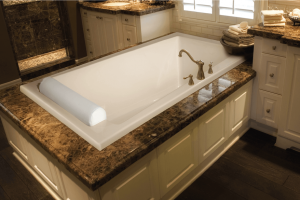 With its six settings and ability to boost low water pressure, you can likely get the massaging experience you want with extra water flow options to enjoy. The installation couldn’t be more straightforward, and you can always remove the water flow restrictor with ease if you need a boost in pressure. We also appreciate that the jets on this head practically keep themselves clean, so all you’ll need to do is prevent grime buildup by wiping down the face occasionally. You now have some options for the best massage shower head, and we hope our thorough guide leads you to the right choice for your home.